In searching for the Orang Pendek, which some believe is a sub-species of Orang-utan, it's worth focusing on the plight of its iconic orange-furred cousin - and a new book out. In the 1960s, it was believed that no more than about 4000 orang-utans remained in the wild. Consequently, IUCN - The World Conservation Union - declared the ape an endangered species, demanding its world-wide protection. Nevertheless, the orang-utan today faces extinction because it is dependent on a rain-forest habitat that is rapidly being demolished due to human greed, and a growing human population. Rijksen was among the first to make a detailed study of the ape in the wild, emerging as an authority on orang-utan conservation. In the late 1980s he became so alarmed by local rumours of the rapid decline of wild orang-utans that he initiated the study leading to this book. Meijaard conducted the ambitious, island-spanning surveys in Borneo and Sumatra to reveal the ape's whereabouts. This is the story of their findings. It is the first comprehensive study of the ape's distribution and status based on a wealth of first-hand field data, and a frank, disturbing account of a mixture of good intentions, ignorance and greed, spelling doom for our Asian relative. 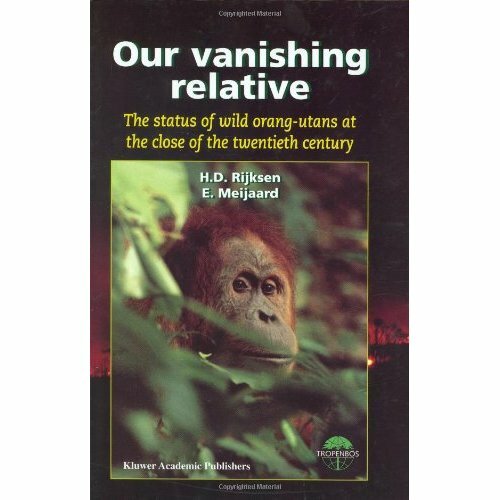 Nevertheless, the authors emphasise that the orang-utan can survive. A realistic plan to save the ape, and with it thousands of unique wild animals and plants, does exist. It is the authors' hope that Our Vanishing Relative, so urgent and eloquent in its description of the deadly net of problems descending over our helpless relative, will awaken attention and empathy in order to safeguard the future of the orang-utan.